I changed some things in my Contacts plasmoid and I don’t know what could I improve on them so I decided to publish it on my blog. It’s my first plasmoid of my bachelor’s thesis and also my first plasmoid experience. I just chose it because it was the simplest part of my bachelor’s thesis and this plasmoid cannot do much. You can simply use it for quickly searching phone numbers or emails of your contacts. 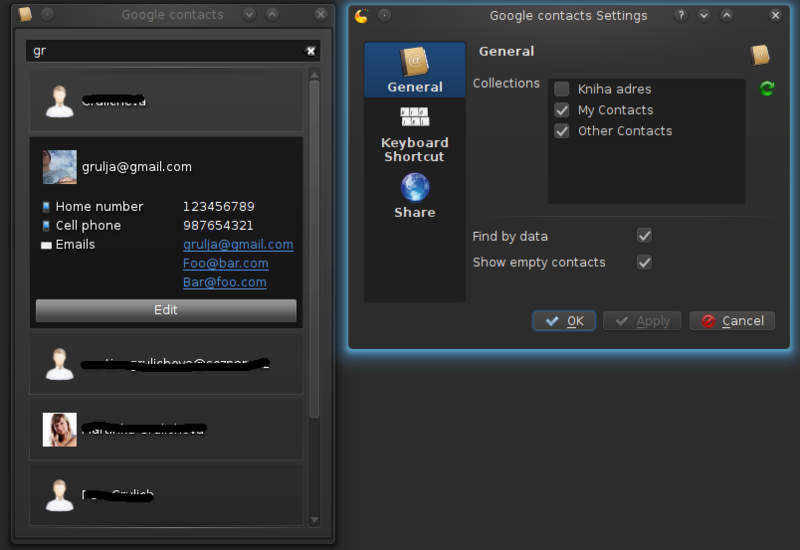 You can also edit your contacts or write them email by clicking on their email address. This plasmoid is designed to use Akonadi-google for your Google contacts but it could work with all Akonadi contacts collections. If you want to use all collections you will have to add -DALL_COLLECTIONS=true to cmake command. I hope that someone will find this useful. If you find some bugs or you have some tips to improvements please let me know. You can get it from my KDE git repository.